Would you make a good radiation therapist? Take our career test to find out how you match with this and over 800 other careers. What is the workplace of a Radiation Therapist like? A radiation therapist is someone who treats cancer and other diseases in patients by giving radiation treatments. Most radiation therapists work in hospitals or cancer treatment centres. Are you suited to be a radiation therapist? Radiation therapists have distinct personalities. They tend to be social individuals, which means they’re kind, generous, cooperative, patient, caring, helpful, empathetic, tactful, and friendly. They excel at socializing, helping others, and teaching. Some of them are also conventional, meaning they’re conscientious and conservative. Does this sound like you? Take our free career test to find out if becoming a radiation therapist is right for you. Radiation therapists work in healthcare facilities or cancer treatment centers. They are on their feet for long periods and may need to lift or turn disabled patients. 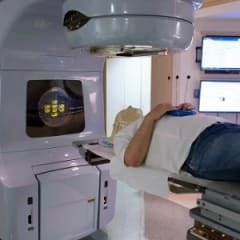 Because they work with radiation and radioactive material, radiation therapists must follow safety procedures to make sure that they are not exposed to a potentially harmful amount of radiation. This restriction usually means standing in a different room while the patient undergoes radiation procedures.